A video posted by Furat FM, a news radio channel in the region, shows American and French flags on display as vehicles drive through what is reportedly downtown Manbij. Pentagon officials wouldn’t comment directly on the footage or confirm the existence of joint patrols. So far, France has been fairly tight-lipped about its deployment of troops to the region as well. In the footage, the U.S. troops are seen in Oshkosh M-ATVs and regular Humvees, while their French counterparts appear to be driving Nexter Aravis infantry mobility vehicles. Additionally, one of the French trucks is spotted with a satellite communications antenna flared out on top of the roof. Both the Aravis and Oshkosh vehicles were designed to deal with the growing threat posed by improved explosive devices and more powerful kinetic projectiles, while retaining the relatively high mobility needed for assault vehicles. In pictures and video that first surfaced on Kurdistan 24, a news outlet in the region, U.S. forces appear to be flexing mine-resistant vehicles, weapons assets and construction equipment to Manbij in order to reinforce two bases there. Furat FM also posted pictures of U.S. and French troops reportedly on the outskirts of Manbij after they had paused their patrol and put themselves in a security posture. Manbij has been a centerpiece in the Syrian conflict, with Turkish forces demanding the U.S.-backed Syrian Democratic Forces leave the area due to the existence of Kurdish fighters in the coalition. Additionally, one American and one British special operator were killed by an IED in Manbij while conducting a mission against the Islamic State group in late March. As recently as August, U.S. troops have reportedly taken fire from Turkish-backed Free Syrian Army rebels in the vicinity of Manbij. The Pentagon publicly acknowledges it has roughly 2,000 troops in Syria, with an undisclosed number concentrated around Manbij. The mixed Kurdish and Arab town was liberated from the Islamic State in August 2016. 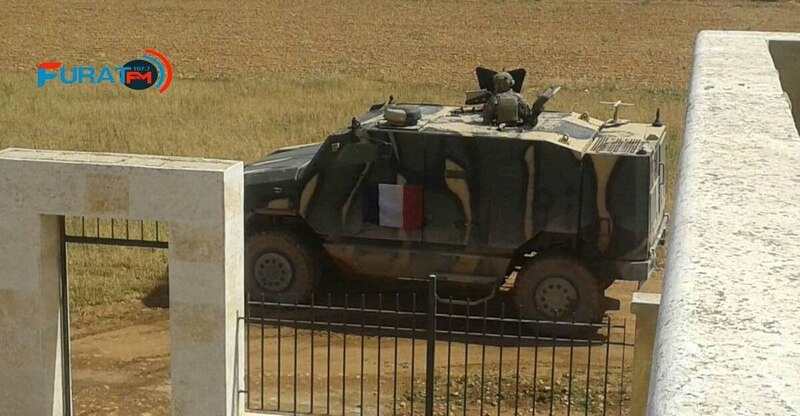 There have been scattered reports from Turkish and Russian state media that the French were building military bases in the vicinity of Manbij, but no official word of confirmation has come from official channels. While U.S. officials don’t talk openly about troop deployments to the tense northern Syria region, that same concern isn’t shared by local Kurdish officials. Rezan Gilo, the joint chief of defense in Syrian Kurdistan, an area known to some as Rojava, told the regional news outlet Kurdistan 24 that French forces were setting themselves up in the region in early April. French President Emmanuel Macron previously expressed support for the continued presence of U.S. troops in northern Syria, despite President Donald Trump teasing a possible withdrawal. After Trump said “we’ll be coming out of Syria, like, very soon,” and “let the other people take care of it now,” he quickly backtracked in an April 24 press conference with Macron. Trump said that before American troops leave Syria, “we want to leave a strong and lasting footprint.” This long-term approach, he added, was “a very big part” of his conversation with Macron, according to the Associated Press.